Professor Peabody, jwmac, Steve N and 2 others like this. He was a complete disaster. headhawg7, JET3534, Reality and 5 others like this. 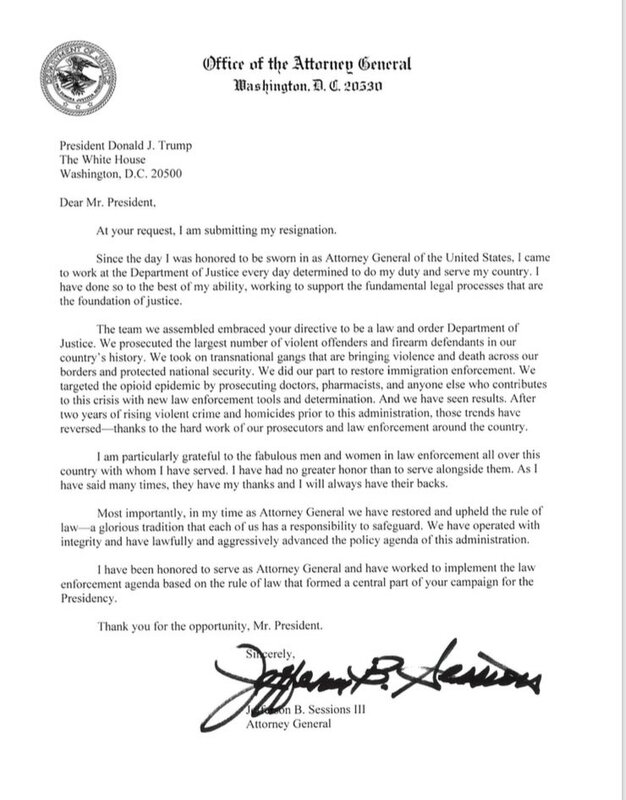 Smart move on his part...now Trump will have no issues getting the AG he wants, thanks to the Red Wave in the Senate. I expect massive investigations into the DNC, Clintons, Obama DOJ, and individual members of Congress, such as Sen Frankenstein and her leaky office. KJohnson, Robert, Steve N and 1 other person like this. Mueller investigation has now taken on a new light as Matthew G. Whitaker takes it over. Where does it go from here? catalinacat, AmericanNationalist, MMC and 3 others like this. Robert, vman12 and jack4freedom like this. Merwen and MMC like this. Nah, he is going to be Chairman of the Senate Judicial Committee...he'll be busy filling the bench with real judges. Great, now Trump can get someone in there before the change of guard and bring charges up on Hillary, the ex- Attorney General and members of the FBI. If the Left is going after Trump, Trump will go after them. Merwen, MMC, Robert and 4 others like this. Heres to hoping Trump finds someone willing to push Anti-Trust actions on Big Comm-Tech and investigate progressive treason instead of crusading against weed. Merwen, Blaster3, Steve N and 2 others like this. MrTLegal, Ericb760, WalterSobchak and 4 others like this. MMC, Robert, Steve N and 1 other person like this. This is horrible news for the Democrats and the resistance. The "Blue Wave" was nothing more than a beach break and now there's an undertow and we all know that Democratic hodads don't surf or can swim. US Conservative, Josephwalker, TheGreatSatan and 2 others like this. Trump is playing chess, while the "Blue Floppers" are playing checkers. US Conservative, MMC and Ddyad like this. I like Sessions. I am disappointed. PrincipleInvestment, TheGreatSatan and Ddyad like this. Yes and I think your going to see it begin very soon. They want to go after Trump, Trump is going to go after them. Just watch what happens next. Dispondent and Ddyad like this. rcfoolinca288, ronv, Ericb760 and 4 others like this. I doubt it, but if that’s where this goes it will not be well received. Firing his hand picked AG and installing a political hatchet man to squash an ongoing investigation into Trumps administration then go on a rampage against former and present political adversaries won’t look good. However it does seem like something Trump would do. We’ll see. Saganist, Ericb760, Sallyally and 3 others like this. This may be where Trump goes off the rails. Let's see how much the Republican Party can stomach. Aleksander Ulyanov, BillRM and PARTIZAN1 like this. Sen. Lindsey Graham (R-SC) told reporters Thursday, "if Jeff Sessions is fired, there will be holy hell to pay." Trump: "hey Lindsey, would you like more power?" "Resigned"? Read the first line. He was fired.